Mauro Icardi has revealed that talks are still ongoing with Inter over his contract renewal and he has insisted that he is not worried by the discussions. 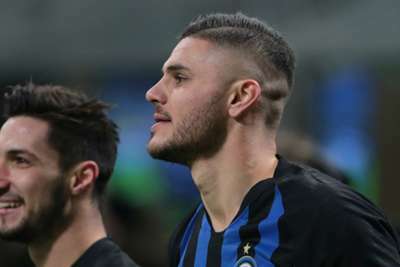 Icardi scored the winner for Inter against Udinese on Saturday, lofting in a brilliantly executed Panenka to get the Nerazzurri back on track following four matches without a win in all competitions. Icardi's wife and agent, Wanda Nara, tweeted on Friday that she had been looking through Inter's proposed contract renewal, but Icardi insisted that there was no announcement to make as of yet. "[Nara] speaks to the club, I just have to do my work on the pitch," Icardi told Sky Sport Italia. "They'll tell me when it's time to sign and that way I don't have to worry about it." Icardi has scored 13 goals in all competitions so far this term, including what looked to be the header that sent Inter through to the Champions League's last 16 against PSV. However, Tottenham's draw with Barcelona meant that Inter will drop into the Europa League, and Icardi insisted that the only way for Luciano Spalletti's side to bounce back from their Champions League exit is to close the gap on second-place Napoli and leaders Juventus. "We had to send a signal after Tuesday's game, as we were disappointed by what happened," Icardi said. "But we knew we were still here in Serie A and can catch the teams ahead of us. "We can forget about the Champions League by winning the next games and end 2018 in the best way we can." Chievo are next up for Inter, before a huge top-of-the-table encounter with Napoli on December 26, with a trip to Empoli to close out 2018.